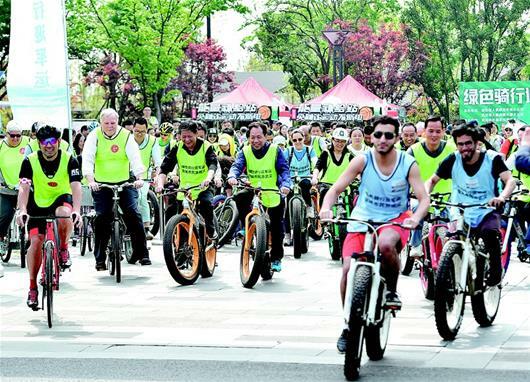 On April 13, a cycling race was organized at the Jiaoye Section of East Lake Greenway in Wuhan, the host city of 7th CISM Military World Games in October. More than 300 Chinese and foreign guests, including representatives of the consulate general of France, the United States, South Korea and the UK in Wuhan, participated in the race. The foreign affairs offices of Hubei Province and Wuhan Municipal organized the event, aming to strengthen the exchanges with those institutions of foreign countries and regions like Hong Kong and Macao in Hubei as well as to welcome 7th World Military Games. The Consul General of the United States in Wuhan Jamie Fouss and his wife cycled around the East Lake for about one and a half hour, enjoying the scenery and taking photos. "This section of East Lake Greenway is really really beautiful and impressive. I really enjoy the scenery," he said. After the cycling, the Consul General of France in Wuhan Olivier Guyonvarch revealed that France will send a delegation of more than 400 people to participate in the World Military Games in Wuhan. He looked forward to developing more cooperation with Wuhan in sports.